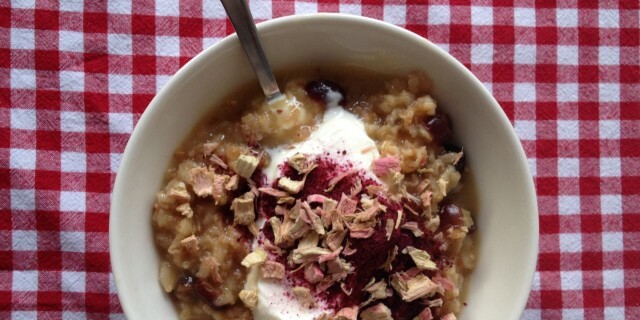 This Three Grain Cranberry Porridge is a real treat. It’s sweet and warming. Cooking the grains in apple juice gives them a beautiful sweet flavour, like apple compote. The tart cranberries become soft, plump and sweet when cooked in the porridge. I eat this on a morning that I have a little more time on my hands and can really take my time for breakfast. If you don’t have much time on your hands, you can also ‘cook’ the grains and cranberries overnight by adding the grains to a bowl with the water and apple juice. Cover the bowl, set in the fridge and let the grains ‘cook’ overnight. You can eat them cold the next day or heat the porridge up to serve it warm. I love the combination of hot and cold so I like to eat my porridge with something cold and creamy like quark or yoghurt. But it will taste really great on its own too or topped with some fresh fruit. To add a bit of crunch, I add various toppings like roasted nuts, granola or freeze-dried fruits. For this porridge bowl, I used freeze-dried rhubarb and blackcurrant powder. Add grains to a small sauce pan. Add the grains, cranberries, apple juice and water. Add a pinch of salt and the cinnamon. Bring up to a boil, then lower heat. Allow to simmer for 10-15 minutes or until you achieve your desired consistency. I like a little bit so I cook them for a little over 10 minutes but if you want a soft and creamy consistency cook for 20 minutes. Add porridge to a bowl, too with quark, skyr or yoghurt. Add toppings if you like. For my porridge bowl, I used freeze-dried rhubarb and blackcurrant powder.